Wolf Creek Indian Village and Museum has been open for thirteen years. The village has survived through blizzards, droughts, floods, and heat waves. It is now getting a face-lift. Some of our wigwams have taken heavy damage and are currently being repaired. When the wigwams were originally built they were made from bent saplings and fiberglass with a resin coating. They let in light and were quite beautiful from the inside but were extremely hot in the summer and inaccurate in design. The new dwellings will be made from a combination of old and new materials. We're replacing the fiber glass with Flexi-bark. (For those wondering why we're not using real bark: It's because it must be replaced every few years and we are trying to be conservative with our resources.) 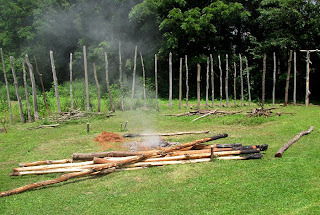 The bottom of poles for wigwams and the palisade are charred to ward off insects and help keep moisture from damaging them. 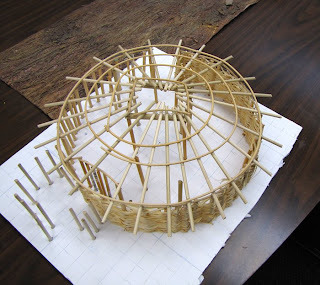 This model represents the frame of one of the new dwellings. It is accurate according to the archaeological dig's specs. (And there is some Flexi-bark right behind it. WHOA. Looks like real bark!) 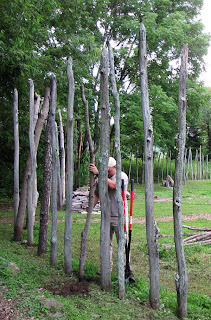 In the top-most photo you can see Sam hard at work repairing the palisade wall. Later this summer we will have vines and saplings interwoven into it to make a protective wall around the village.